A health bar recipe with fresh strawberries and sunbutter! A delicious treat that is healthy with no added sugars and it can be enjoyed any time of the day!! Great snack for when you need a boost of protein, energy or if you just simply want something healthy and tasty to curb a craving for sweets. If strawberries aren't in season when making this recipe look for frozen organic, or while they are in season and ripe dice and place in freezer bag to have on hand anytime!!! I love sunflower seed butter and I used sunbutter for this recipe however if you are allergic to sunflower seeds try another alternative like wow butter (contains soy) or another peanut butter free alternative of your choice! What is your favorite PB alternative or do you skip this all together because of allergens? Share with us on Facebook! Check out my Dessert Recipe Cook Book for a delicious PB alternative made from pumpkin seeds, I used it for a PB chocolate cup recipe that is absolutely delicious!! I love dates as they are great way to add a little sweetness with out adding unnecessary sugars! Did you know that dates are packed with potassium, fiber and contain a little protein? 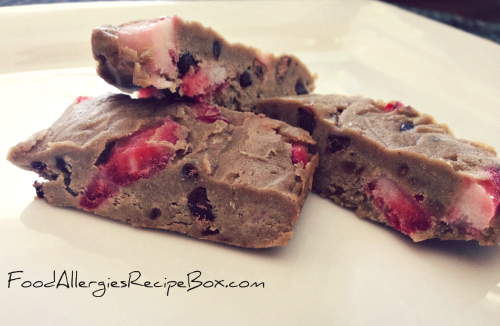 Ingredints FOR Strawberry sunbutter health bar recipe! In a food processor combine; applesauce, vanilla, dates(check for seeds), avocado, sunflower seed butter, and salt - pulse ingredients until smooth and creamy. Once smooth and creamy slowly pulse in the vanilla protein powder. Scoop mixture into a mixing bowl. Clean the strawberries remove the top and dice into quarters, place strawberries into the mixing bowl and add the chocolate chips, stir ingredients by hand until well combined. On a piece of parchment paper scoop mixture into the center and smooth out into a rectangle. Carefully fold parchment paper over dough and even out the edges. Place mixture into the freezer for approximately one hour, cut into small servings and enjoy or place back into the freezer and take out a piece for a quick snack. The mixture will become very solid in freezer, feel free to allow piece to thaw for 5 minutes before enjoying or keep in the fridge for a softer treat. Return from Health Bar recipe to Food Allergies Home Page!